Let's face it; learning is complicated. In fact, the more we learn about learning through research, the more complex and nuanced our understanding of the processes involved gets. The good news is that we have, in fact, learned a great deal in the past few decades about how the brain goes about committing new knowledge and skills to long-term memory. The bad news? Much of this information is sitting in obscure journals on dusty library shelves and sitting on websites only visited by cognitive scientists, psychologists, and neuroscientists. For many of us in education--those of us who need this information to inform our daily work with students--some of this information may just as well have never been discovered, since so little of it has made its way into mainstream education channels and teacher training institutions. But never fear; in this article, and those to come in the next few weeks, I will tackle all of this complexity and break it down for you in ways that will allow you to apply the information to your own teaching practice. The first step in learning anything is encoding, so let's start there. In this first stage, the learner inputs something (new information, a new idea, a new skill) through his senses. If he deems it worthy of attention, he focuses his consciousness on the material. This means that he pulls the salient aspects of the material, plus any related information from prior knowledge, into working memory and processes it in some way. During and immediately following this processing, the brain undergoes chemical and electrical changes that form a mental representation of the material that is stored in memory. Encoding is the crucial initial stage of learning anything new. If encoding doesn't happen, the brain has nothing new to consolidate into long-term memory over the coming hours, and there will be nothing to retrieve from that material later. In other words, without encoding, no learning takes place. In my mind, there are two crucial roadblocks to encoding that teachers must keep in mind when planning and delivering lessons: attention and prior knowledge. If the student doesn't bring attention to the material, she doesn't pull the new material into conscious working memory for processing. If this doesn't happen, no learning will take place. So making sure students are paying attention to the material is critical. 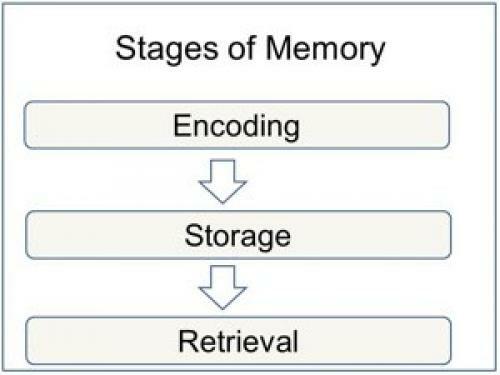 Students also need to be able to connect the new material to what they already have stored in long-term memory (prior knowledge). Teachers who habitually pre-assess their students for prior knowledge before teaching new material will be in great shape to design effective processing activities because they are already aware of what each student does and does not know about the material to be taught. Teachers who have not pre-assessed for prior knowledge are simply guessing about what their students know--and guessing is never a good teaching strategy. Armed with good pre-assessment information about their students' knowledge, teachers can design processing activities that are "just right" for their students. If a processing activity asks students to process something they already know, the activity will be boring. As a result, students will not pay sufficient attention to the material, and encoding won't happen. If, on the other hand, the activity asks students to process material that is well beyond their current prior knowledge, they will be unable to make connections to the new material, they will struggle, and many of them will give up on the activity. Once again, attention is lost and encoding doesn't happen. So, to summarize, if teachers want encoding to take place (and we do), they need to make sure that their students focus attention on the material and make sure that the material they ask students to process is closely enough related to their background knowledge of the topic so they can make connections. So, let's assume a teacher is well aware of the importance of attention and prior knowledge and keeps these issues in mind when she sits down to plan the processing activities to be used during a lesson. Are these the only considerations that she needs to be mindful of in her planning? Not at all. For one thing, she needs to choose the specific type of activity she will have the students engage in for their processing. At this point, I think I should point out that both the structure of the activity and the content to be processed during the activity are important. By "structure of the activity," I mean what students are asked to do. A think-pair-share is a structure. A reciprocal reading activity is a structure. A gallery walk is a structure. When I talk about the "content to be processed," I'm talking about the material that students will talk about during the think-pair-share, the material the students will be reading during the reciprocal reading, the material students have posted to be shared during the gallery walk. I know I run the risk of sounding too simplistic here, but I think it's important to unpack these two aspects of processing activities and look at them separately because each of them impacts learning differently. Will an individual processing activity be best at this point? A pair activity? A small group activity? Do the students need to move during the activity? If so, how vigorously? Could the students benefit from a social component during the processing? Or would it be best for them to do the initial processing individually, then add the social component with a sharing activity? These and many other questions need to be entertained when selecting the structure of a processing activity. What about the content of the activity--that is, the material that students will be processing? Key considerations here have to do with how near or far the material is to students' prior knowledge and the overall complexity/difficulty of the material. As mentioned previously, if the material is already known by students and is thus too easy, students will be bored and will goof off during the activity. If, on the other hand, the material is too foreign to students or too difficult for their current understanding of the topic, the activity will be frustrating, and students will give up. So here's the take-away: choose a structure for your activity that will maximize engagement and attention, and choose content for the activity that aligns with the "sweet spot" of your students' current understanding of the topic. OK, if a teacher has taken into account everything outlined above as he plans his lesson, he will have pre-assessed his students on the material that he plans to input, he will have carefully chosen structures for his processing activities that will help get and hold students' attention, and he will have carefully chosen the content to be processed during these activities so that they allow students to make connections to their prior knowledge. And all of that is good--but there are still a couple of factors he can build into his processing activities to ensure that great encoding happens. Those two key factors are: (1) relevance and (2) emotion. Ask yourself, "In what way or ways is the material relevant right now to my students' lives outside of school? How can they apply this material in their day-to-day existence?" Find an answer to these questions and build those connections into both the input portions of your lesson and into the processing activities following that input, and you will have a winner! The brain simply pays much better attention to information it deems relevant, so relevance always boosts encoding. Emotion is also a powerful encoding booster. When we have strong emotions concerning something, our brain chemistry changes in order to maximize the chances that we will learn from the situation. This is why we tend to remember the highest highs in our lives and the lowest lows, but we tend to forget the same-old-same-old everyday experiences. Now, I realize that it's not always possible to make a clear connection to relevance with every topic you teach. Similarly, it's not always going to be possible to raise the level of emotion around every processing activity. But it is certainly worth the effort to try to include these two "encoding boosters" whenever possible. Use this list as a checklist whenever you sit down to plan your lessons. Simply running through it and asking yourselves the questions will help you make good choices for lesson design that will maximize your students' initial encoding of the material. And be on the lookout for upcoming articles, where I'll go into the steps you need to take to follow up this good initial encoding in order to maximize long-term memory.